2 Master en-suite bedrooms with Queen pillow top beds, LCD HD TV, Blu-ray/DVD, one with pool door, side chair and table with views of the pool. 2 twin bedrooms (one Disney themed) that share a 3rd bathroom. Ideal for 2 families to share. Fully fitted kitchen with all the utensils you require. Washing machine & tumble drier. Luxury Italian Porcelain tiles throughout wet areas. 2 Phones with Free local, long distance and International calls (to 100 countries including U.K. and Canada). Answer machine. Sony Playstation2 with a selection of games. 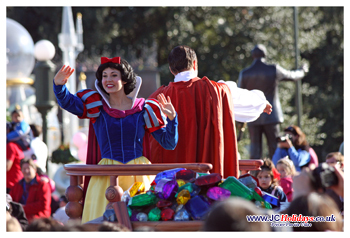 4 Cable LCD HD TV's, 1 Cable Disney TV, Free DVD/Blu-ray, Free CD system with a selection of films, music and games. After all the fun of the fair, there's nothing nicer that to come home, kick off your shoes and relax in luxury. 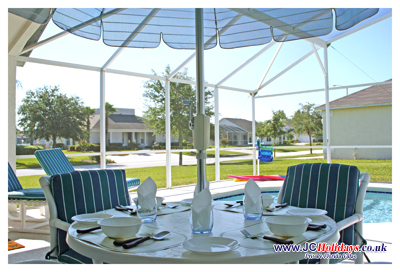 Book this JCHolidays Florida villa and you could be doing just that..... sitting beside a luxury south facing private pool to catch the last of the Florida sunshine, raiding the fridge for just what you fancy whenever you feel like snacking, gathering round the table to plan tomorrows activities, perhaps cooking up a barbeque for an al fresco feast on your patio, or lounging in front of the cable TV in an air conditioned room while you recharge your energy levels... In short, enjoying all the comforts of home and much more; with all the excitement of Orlando Florida!!! Upgraded South facing private pool with oversized deck area. Extra upgraded pool furniture. Sony Playstation with a selection of games. 4 Cable LCD HDTV's, 1 Disney cable TV, Free DVD/Blu-ray, Free CD system with a selection of films, music and games. Full air-conditioning. Ceiling fans in all the main rooms including the pool deck. All linen, pool and bath towels included Free of charge. 24 hour on call management company. Free BBQ, 2 Free safes. Free baby equipment, cot (crib), High Chair, Pram (stroller). 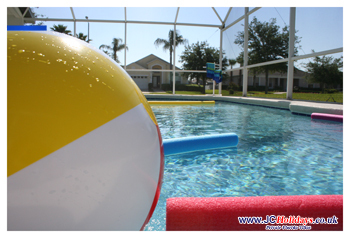 Many safety features including a monitored burglar/fire alarm, pool alarm & child safety fence. 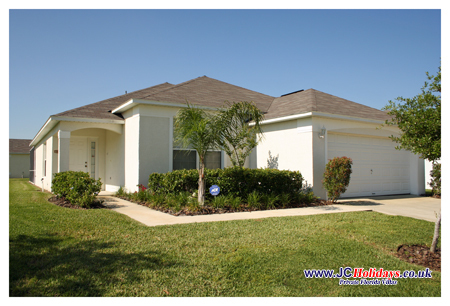 30 min from Orlando International airport. 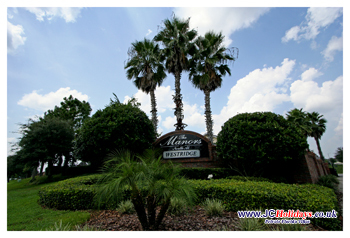 2 min to Shops, restaurants & championship Golf courses (one just next door). 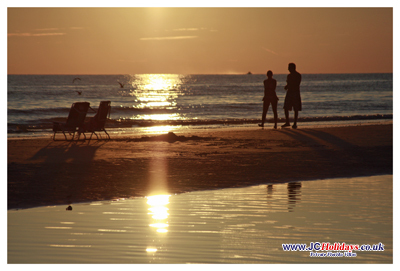 Just over 1 hour from the gorgeous beaches of east or west coasts. 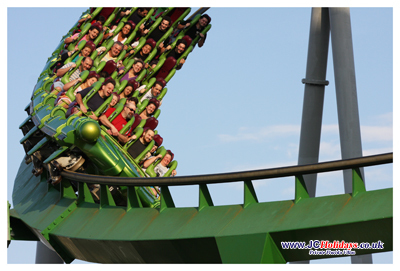 Close to all Orlando's theme parks & attractions. Close enough to all the action of Orlando, Florida but set back amongst the Orange Groves and rolling hills. Your Villa is Fully Loaded!! !